The past few weeks have been a bit busy. We flew out to Boston to meet the newest addition to my husband’s family. It was a nice getaway, a little cold, but still pretty relaxing. When ever I miss a weekend around the house though, I tend to go into crazy mode the following week feeling like I need to catch up with life…especially because I have so much to do and a major deadline I have to meet. And by deadline, I mean delivery date! I guess technically I have multiple deadlines as my lack of abilities, such as energy and mobility, are becoming more and more apparent. 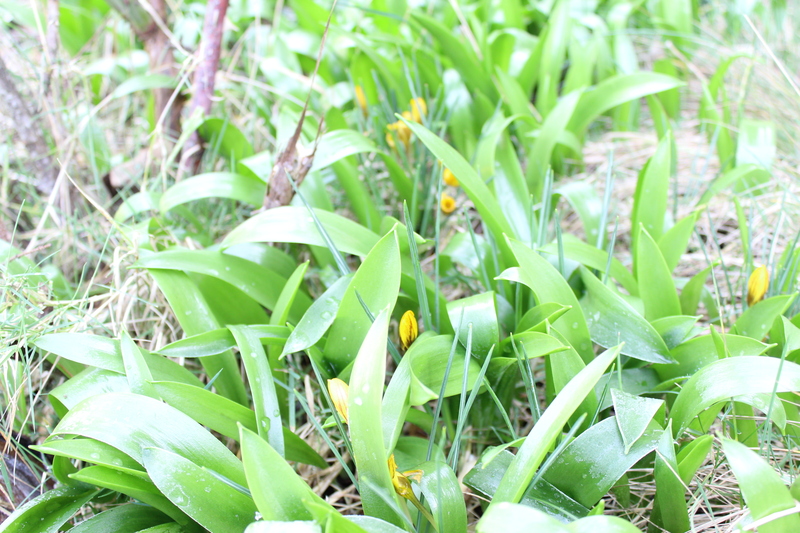 We arrived home from Boston to find our spring flowers were starting to bloom. 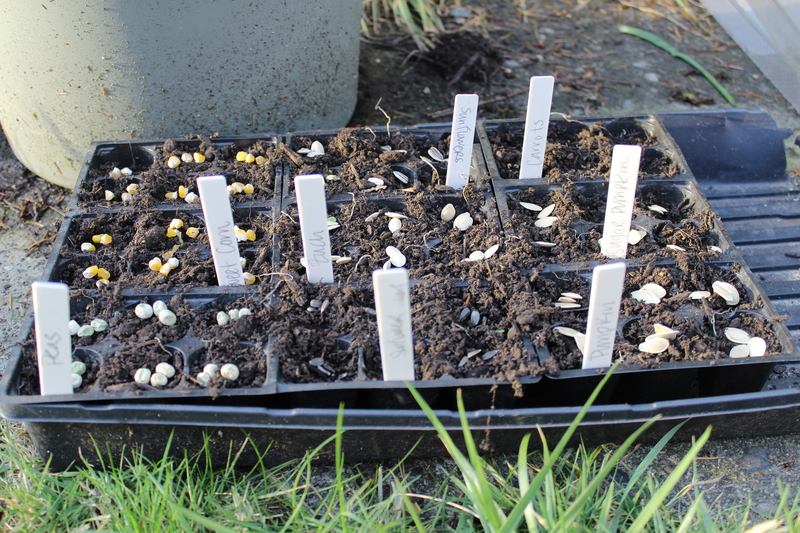 In to a decent vegetable garden this summer, I really needed to get moving on the seeds. 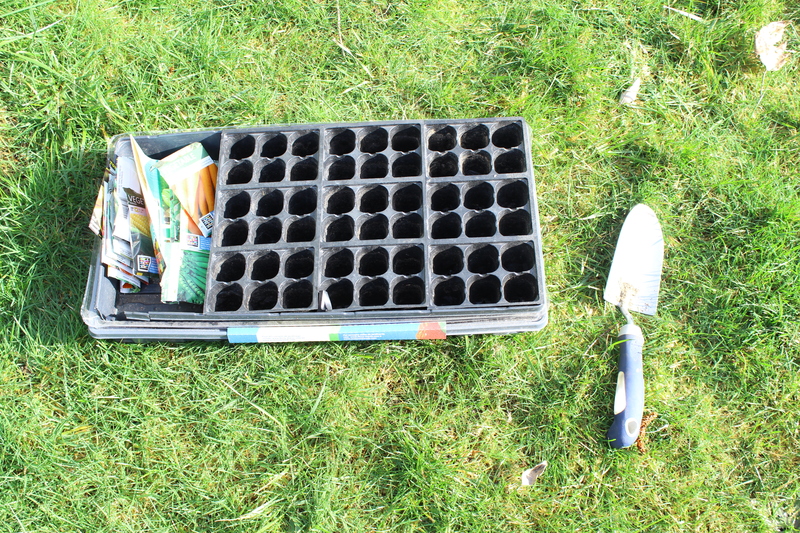 I keep my trays each year which makes it pretty quick and easy to sow the seeds. Each year I tell myself that I am going to venture out with new seeds, but each year when I buy them I end up with the same staple items – peas, corn, zucchini, pumpkin, carrots, and sunflowers. I haven’t been successful at growing tomatoes from seeds, and our neighbors up the street do. Each spring they have a tomato plant sale in their front yard, and they grow wonderfully. And I’d love to have lettuce, but mine always turns out super bitter. Any suggestions? 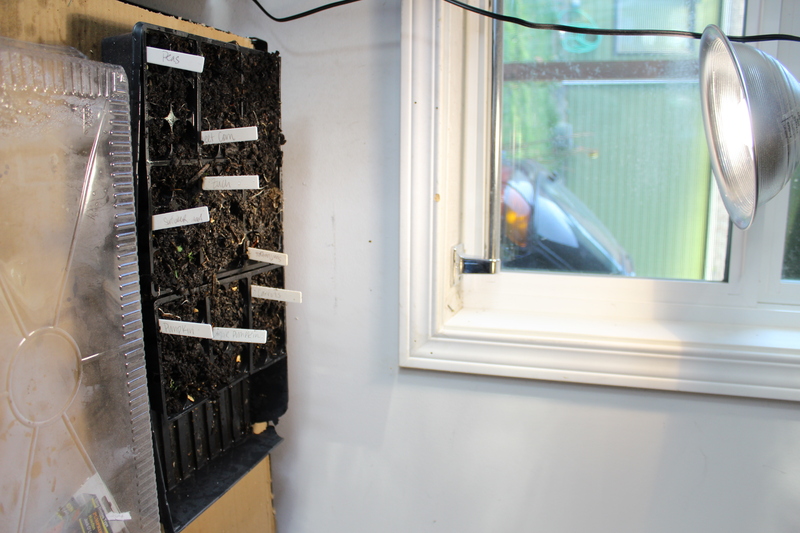 I start my seeds in the garage under a grow light, and hopefully in about a month – month and a half they should be ready to move outside. 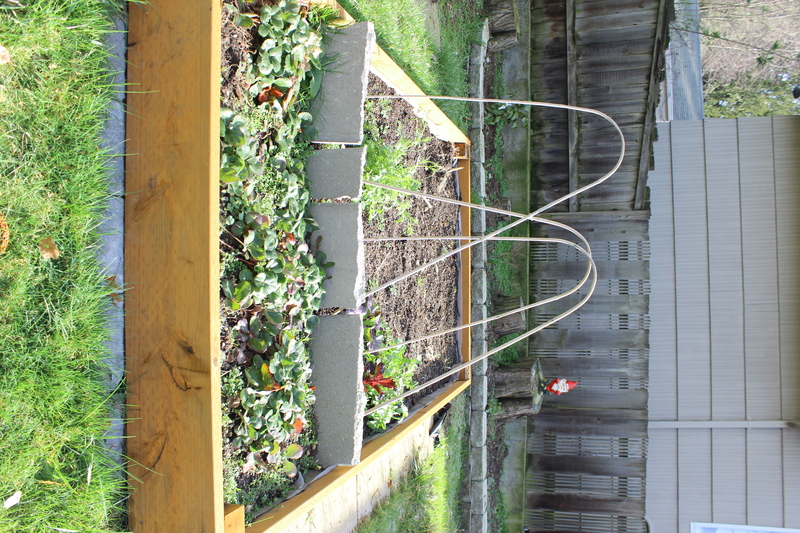 Which also means that Jesse and I are going to need to get moving on building our second raised bed. We built one here last year, but afterwards we decided to save the second for this year, which is now…unfortunately! We typically don’t have a lot of big all day projects that require both of us, so it’s kind of fun. We always buy the supplies weeks prior so we can’t back out, and then we start the day with a nice big relaxing breakfast and shoot for starting around 10am. It’s a nice routine. So that is how the front yard is gearing up for the summer…as far as inside the house goes…we have a nursery to put together! I had been putting the nursery off for a bit. I had put if off deciding that once I knew the gender, that is when things would begin. I wish I could say that the bedroom just needed new paint on the walls. But not only does it need paint on the walls, it also needs it on the ceiling. 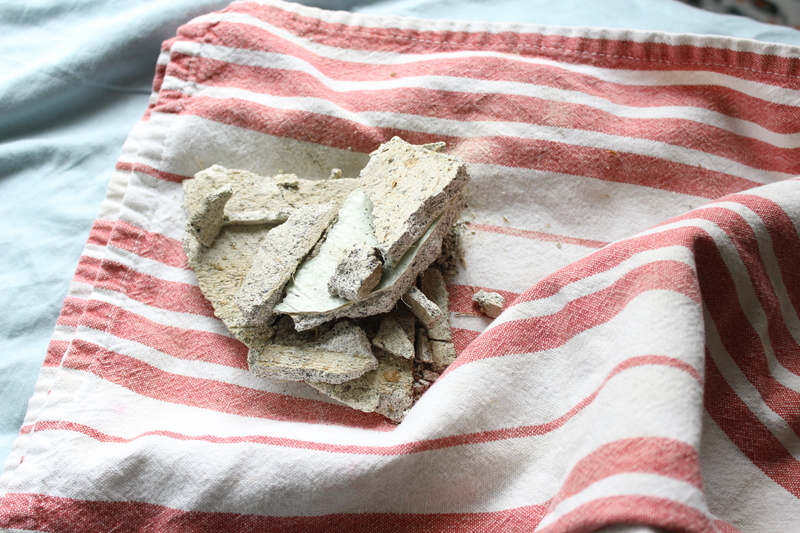 But before we can paint the ceiling, I have to finish patching it. 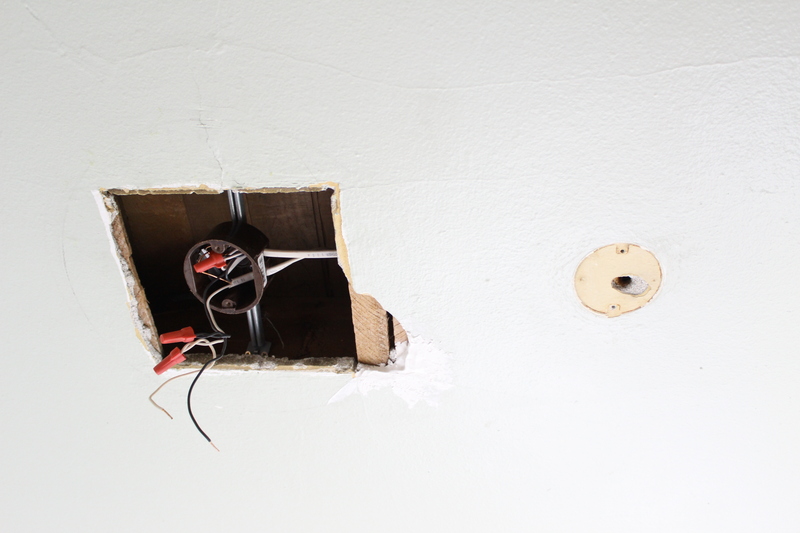 When we first bought our house in fall 2009 we ended up having the whole electrical system updated, which left us with over 40 holes around the house that required patching. This room I left because it wasn’t used much. I had most of the holes dealt with but needed to finish the ceiling before painting. This is how the ceiling started out last week. 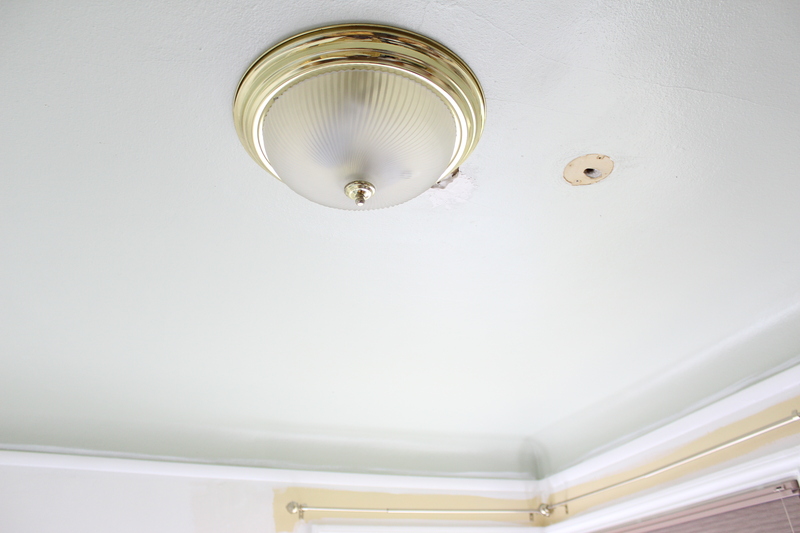 I knew that there was a little area that was going to need my attention under the flush mount ceiling light. But once it came off, it turned out that the electrical hole was worse than I thought. 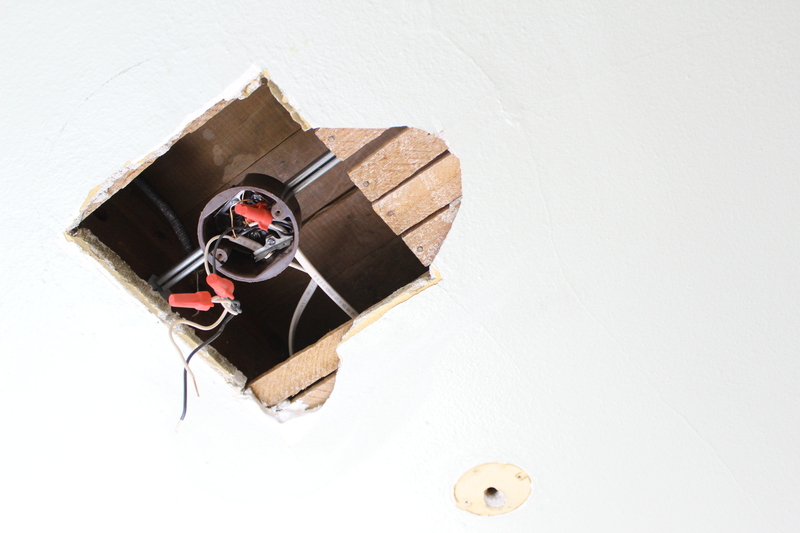 And not only that, but when the electricians did their work, I think they probably knocked some plaster loose because there was a huge crack extending out that was not attached to the lathe. So what did I do…I pulled it out. I couldn’t help myself, it’s like an itch that needs to be scratched. 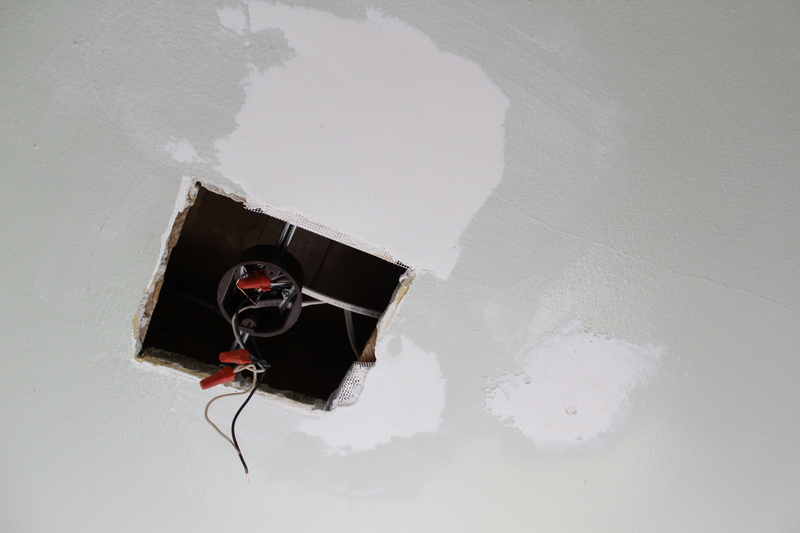 I decided to put the patching on hold for a week while I wait for the new light fixture to arrive. It is a flush mount, but the diameter is smaller than the hole, so I am going to have to figure out a way to stabilize everything and patch inward. I figured waiting for the fixture would be a a nice break and then I can double check all the measurements once it arrives. And then besides that, I have about 3 other projects in the works that are almost complete…which I will be able to share next week! And in other big news, our bedroom is so close to being finished. I just have a few more things I have to find to fully complete it! Can’t wait to cross that off my list! I will share very soon! I love following your blog, are you on facebook too? Thanks! I’m not on facebook yet. I keep thinking about it, but haven’t done it.